By 2020, India will emerge as the youngest country, with a median age of 29. It will also become one of the biggest countries to have a thriving pool of millennials in its workforce. According to a recent SHRM research, millennials or Gen Y will comprise 50% of India’s workforce by 2020, and by 2025, this percentage will increase to 75%. While a young workforce is good news for the country, questions about millennial employability are coming to the fore. The labor ministry reports that less than 25% of MBAs, 20% of engineers and 10% of graduates are employable. ASSOCHAM concurs - only 20% of the five million students who graduate every year find employment, according to its recent report. The industry, for its part, blames the academia for churning out graduates who have very limited interaction with the real world of work, making them ‘unemployable’ unless retrained and reskilled. Digest this – 94% of Indian engineering graduates are unfit for a job, with only 4.7% having the ability to write the correct logic for a program - the bare minimum requirement for any programming job. This grim reality begs the question: how can millennials transition smoothly to employment, given what employers want in 2019 and beyond? As the world braces for major social-political and technological disruptions, India too finds itself in the midst of change. While the business landscape has evolved with technology making a mark across industries such as IT, retail, manufacturing and others, India’s educational curriculum has failed to factor in market realities. For instance, as automation gathered steam and companies started leveraging technology to eliminate repetitive manual tasks, educational institutions ignored a key opportunity. They failed to see that the demand for specialized and advanced technical skills such as data science, machine learning (ML), and Artificial Intelligence (AI) was picking up and they needed to upgrade their curriculum to equip students with relevant knowledge to ensure they are job-ready. The result: the country is confronting a two-pronged skills issue. On the one hand, the country’s vast pool of students is graduating with technical skills that are soon going to be redundant. On the other, there is a severe shortage and high demand for people with advanced skills in new-age digital technologies. Nearly, 40% of IT professionals in India will need to upskill themselves over the next few years to remain employable. This, when 48% of Indian employers report difficulties in filling job vacancies due to talent shortage stemming from lack of relevant skills. Clearly, relying on the educational system alone will not solve the country’s double-edged talent dilemma and it’s time for stakeholders to join hands to ensure the employability of millennials. But to do this, it is first important to understand what employers are looking for. #1 Emotional and social intelligence: A growing number of employers believe that candidates with a high emotional quotient (EQ) are better prepared to lead teams and drive change as emotions are strongly correlated with performance and productivity. 2019 and beyond will see the focus on hard technical aspects decline slightly and the focus on softer emotional and social aspects increase significantly. Companies are now aware that not all people react and respond to situations in the same way and the healthy development of advanced social and emotional intelligence is critical to sound decision-making and competitive success. What employees/freshers can do: Studies show that though the basic level of EQ is based on personality and upbringing, it can be increased. You can boost your EQ by working on improving your self-awareness, self-regulation, motivation, social skills and ability to show empathy. What employers can do: Leverage scientific assessments to accurately assess candidates’ social and emotional intelligence and based on the results, recommend actions, courses, and activities to build upon the score. #2 Technical skills in emerging technologies and functions: Emerging technologies such as AI, ML, blockchain, IoT, Natural Language Processing (NLP) will see increasing demand. 70% of Indian organizations will deploy AI enabled solutions by the end of 2019, leading to a 50-60% jump in the demand for professionals skilled in AI, ML, Deep Learning, and robotics technologies. Currently, there is an acute demand-supply mismatch for AI talent, especially in roles related to natural language processing (NLP), deep learning, and machine learning. Even for the professionals not expected to be in strictly technical roles, familiarity with AI, data science, and analytics technologies will be highly sought after. Similarly, the demand for data scientists, cyber security and digital marketing professionals is also skyrocketing in the digital age while the talent gap continues to widen. What employees/freshers can do: Irrespective of the stage of your career, take appropriate courses in data science, analytics, AI and ML technologies to stay relevant in changing times and be able to chart a fresh career path, if needed. What employers can do: Partner with experienced ed-tech firms and dedicate resources, time, and money to reskill and upskill new and existing employees in emerging technologies to stay ahead of the evolving business curve. #3 Ability to thrive in a ‘co-bot’ environment: As automation evolves from ‘robotic’ to ‘intelligent’, more companies will embrace intelligent bots to boost efficiencies, reduce costs, and free up their workforce to focus on more value-adding tasks. The result will be a more fluid, collaborative workplace where humans and bots will harmoniously boost each other’s capabilities. What employees/freshers can do: Embrace change and familiarize yourself with common forms of automation such as chatbots to discover how you can complement your strengths leveraging technology. What employers can do: Train technical as well as non-technical workers on the usage of technologies within your business to ensure optimum adoption and uptake leveraging engaging training methods such as online microlearning courses and gamification. #4 Aptitude to learn continuously: More than ever, continuous learning is in vogue today as business scenarios, challenges, technologies, and consumers’ expectations change rapidly. With technologies changing every 12-18 months, both tech and non-tech professionals are expected to constantly update themselves. What employees/freshers can do: Proactively ask your organization’s L&D team members for courses that can elevate your career. Don’t hesitate to ask for funding, time out or any other help you may need in completing the necessary training. If you are looking for a new job/change in career path, enroll in specific courses to realize your aspirations. What employers can do: Inculcate a culture of continuous learning by making learning relevant, engaging, and accessible at the point and time of need. Adapt L&D programs to the demands and needs of modern learners who are more mobile, tech-savvy and have dwindling attention spans. Incentivize and reward learning behavior by creating clear career progression paths. Tech Mahindra: Opened a five-acre tech and learning center to focus on employability, skill development and job readiness of new graduates. TCS: Joined the ‘Closing the Skills Gap 2020’ global initiative by committing to train 10 million people and provide the online platform that will help skill people who are facing the threat of losing jobs to technology. Philips: Set up an AI lab at Manipal University, called the HealthSuite Insights Lab, to support the adoption of analytics and AI in key healthcare domains by training university students in AI skills and applications. IBM, Mphasis, Wipro, Infosys, SAP Technologies, EXL Service: Partnered with universities such as Manipal, IISc, UVCE, MSRIT and IIT-Kharagpur to influence their curriculum according to market needs. Millennials are forced not only to spend years in classrooms, but also navigate a confusing jungle of jobs that didn’t exist even a decade ago, and may cease to exist in a decade or two. How can they successfully navigate the maze of rapid work changes? The answer lies in plotting a career path that visualizes possible directions and takes into account several factors such as personality, experience, interests, cognitive ability, and more to identify what works best for an individual. Technology-driven scientific assessments can help millennials do just that. Alternatively, organizations can embed an active training policy in their business model a la Denmark’s Flexicurity model that helps workers hop jobs and offers retraining options as and when required. 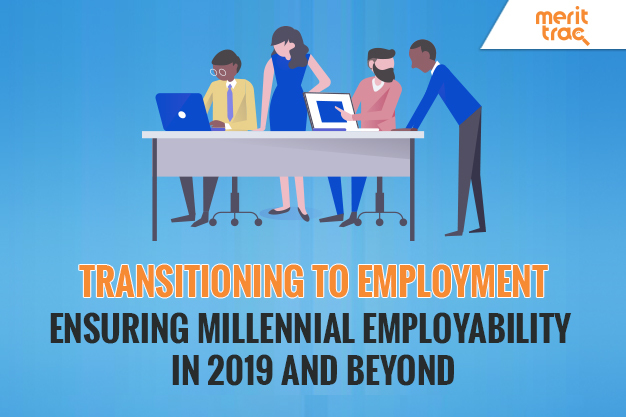 The bottom line: ensuring millennial employability in 2019 requires businesses as well as students to redirect their focus from academic degrees to real world skills that matter in 2019 and beyond.